The hurricane of 1813 pummeled Charleston for a relatively short time. It was first felt between six and eight o'clock in the evening of Friday, August 27, and by daylight the wind had died away. Although brief, the cyclone was fierce, "one of the most tremendous gales of wind that ever was felt upon our coast," with a constant deluge of rain. For six hours, wind blew at hurricane force, driving in the storm surge at midnight. The rush of water equaled the horrific flood of 1752; the high water mark was reported to have been eighteen inches higher than during the "great gale" of 1804. By morning, the fast-moving storm had traveled up the coast. The litany of damage was familiar. In every part of the city, trees were uprooted or snapped. Buildings had blown down, fences washed away, animals lost or drowned. Water and wind had wrecked some houses and damaged many more, toppling chimneys and tearing away roofing. The top of Mr. Ross's windmill at the head of Tradd Street was blown off, Peyton's Bridge on the Meeting Street Road was ruined, Cannon's Bridge swept away by flood waters and its causeway badly eroded; but "by far the most expensive single loss" was the New Bridge across the Ashley River, completed in July 1810 at an estimated cost of $175,000. East Bay Street, from Hasell to Wentworth, presented "nothing but a scene of ruin, completely strewed with lumber from the wharves, wrecks of boats, parts of houses…" Storehouses along Vendue Range had flooded, all the goods on the lower floors soaked in salt water. The wharves and docks were a "melancholy scene of distress, of vessels crushed on against the other, or thrown up high and dry." Commercial losses were heavy, but, as the Charleston Times remarked, "had it not been for the present state of things, that left little merchandise and less shipping here, the loss would have been immense." The "state of things" was the War of 1812. The United States had declared war against Great Britain on June 18, 1812. For over a year, lowcountry merchants and planters had suffered not only the loss of British trade, but also threats from British warships that maintained a porous but dangerous blockade of the harbor. Some merchant vessels slipped through. Others were captured, while local privateer schooners ranged from the Carolina coast to the Caribbean in their search for British vessels to "take" as legal plunder. Privateers and warships were stout, well-manned vessels. Among the few ships to ride out the storm were two United States schooners, the Nonsuch and Carolina. The privateer Decatur and her prizes, HMS Dominica and the merchant ship London Trader, all broke away from Lathrop's Wharf, Decatur and Dominica crashing into Prioleau's Wharf, and London Trader into the packet ship Belle. All would be repaired at great expense. Another prize, a large brig being used as a prison ship (on which were most of the crew of Dominica), broke her anchor cables and grounded in the marsh on James Island. The storm took a serious toll on recent improvements to Charleston's fortifications. At least twenty feet of the stone wall under a wooden battery "lately erected on East Bay Street" collapsed under the weight of its guns. There was great concern for the fate of the gunpowder stored at the State Magazine (at Shipyard Creek since 1772). The Courier learned that water had been several inches deep on the floor of the "new building," damaging a quantity of powder, most of it belonging to the State of South Carolina. "Dreadful Gale." Charleston Times, August 28, 1813. "Dreadful Storm." Charleston Courier, August 30, 1813. Coker, P. C. Charleston's Maritime Heritage, 1670-1865. Charleston: CokerCraft Press, 1987. 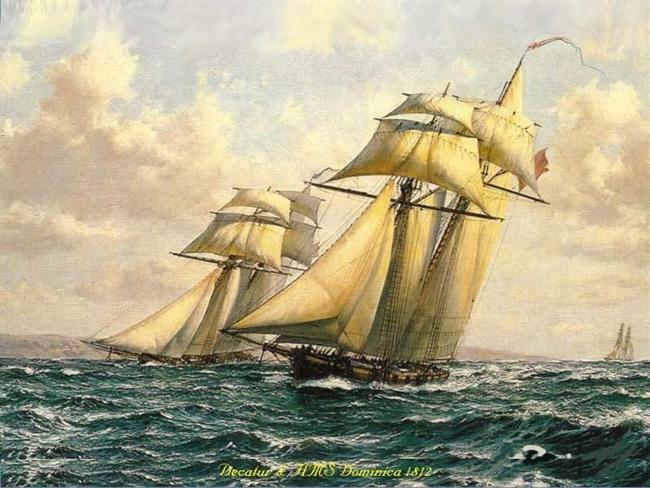 On August 5, 1813, after a fierce battle off Surinam, the Charleston-built privateer Decatur took the British schooner-of-war HMS Dominica and brought her in as a prize. A week after the ships arrived in Charleston Harbor, both were mauled by the hurricane. 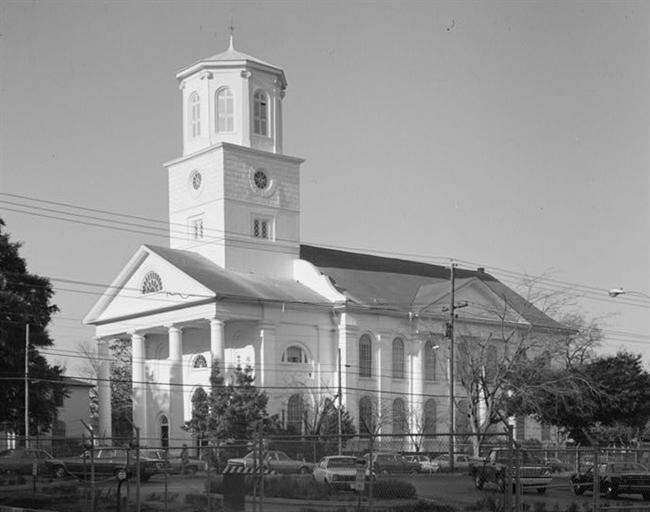 Second Presbyterian Church, 1977 view. Dedicated in 1811, the church "sustained considerable injury - the lead that covered the top of the roof, with a considerable portion of the slate, have been carried away, and some window sashes blown in." The storm tore roofing from dozens of houses, the damages "not easily remedied as there are no slates to be had." 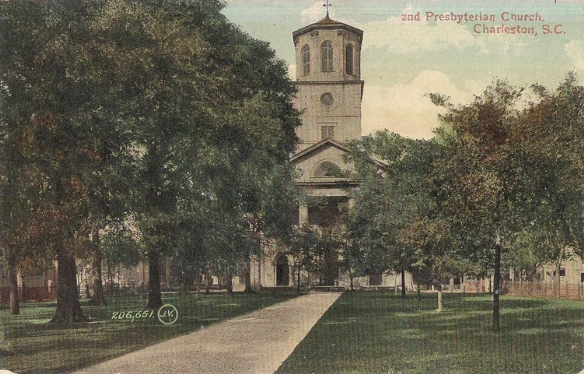 Second Presbyterian Church, early twentieth century view facing east. 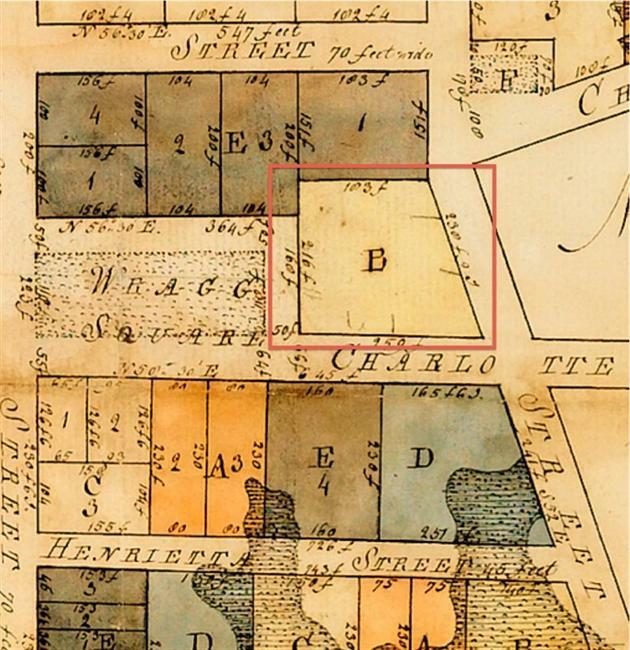 The location of Second Presbyterian Church is shown on this 1801 plat of Wraggborough, surveyed by Joseph Purcell.